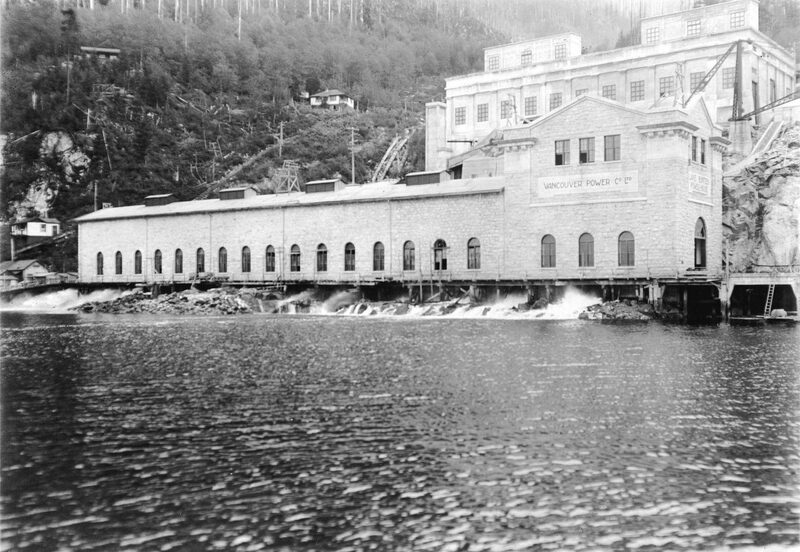 Powerhouse #2, during construction circa 1913. Reference code AM54-S4-: LGN 1169. 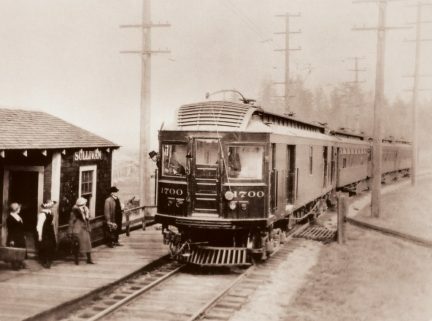 Photograph courtesy of the City of Vancouver Archives. 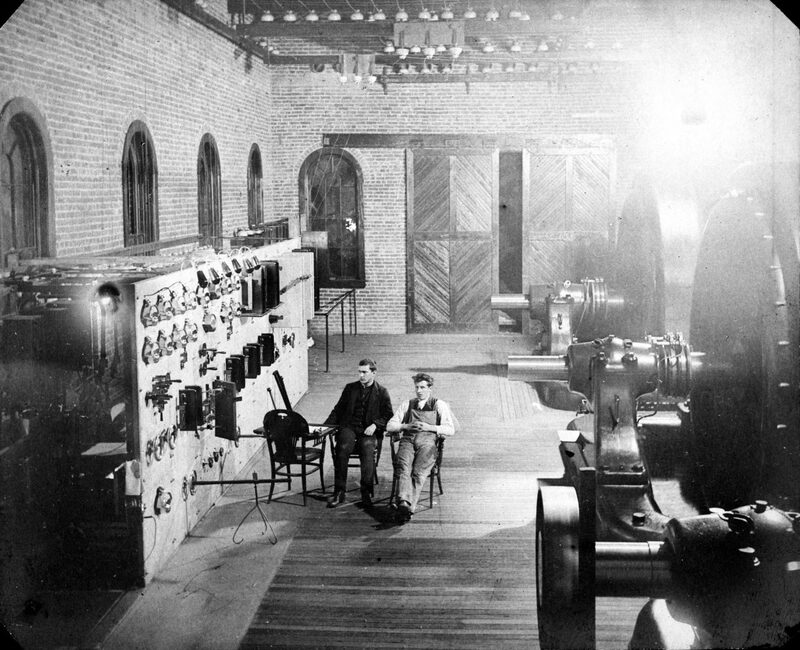 Interior of Powerhouse #1, circa 1907. Reference code AM1376-: CVA 82-03. Photograph courtesy of the City of Vancouver Archives. 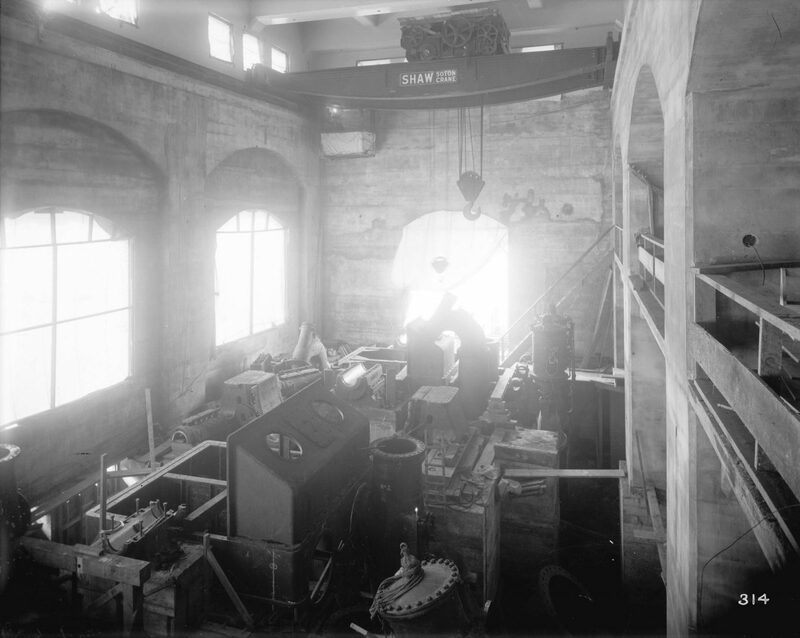 Interior of Powerhouse #2 during construction, circa 1913. Reference code AM54-S4-: LGN 1168.2. Photograph courtesy of the City of Vancouver Archives. Powerhouse #1, shortly after completion in 1905. Reference code AM54-S4-: Out P604. Photograph courtesy of the City of Vancouver Archives. Powerhouse #1, July 2017. Photograph courtesy of Eve Lazarus. Powerhouse #2, July 2017. Photograph courtesy of Eve Lazarus. Nestled amongst the trees on the eastern shore of Indian Arm are two gothic-looking buildings that have been weathered by more than a century of rain and damp. Patrolled and off-limits to the public, they are little more than curiosities today, a favourite of urban explorers and film crews looking for somewhere appropriately creepy (most notably used as Pennywise’s lair in the 1990 miniseries It); but when they were first constructed at the dawn of the electric age, the Buntzen Lake Powerhouses were big news. Not only were they the first of their kind in North America to be created in a very specific way (more on that to come), but they were also at the centre of a major controversy—one that involved corporate skulduggery and corruption at the highest levels. It was an epic power struggle between the company who built them, the federal government, and the City of New Westminster. It was back in 1897 that the BCERC—the predecessor of BC Hydro—was born. And while the company’s board and shareholders were based in London, the task of supervising North American operations was handed to a Danish-born immigrant named Johannes Buntzen. Later dubbed the granddad of electricity in British Columbia, Buntzen was seen as level-headed and forward-thinking, a man popular in the city and among his employees. Behind the scenes, it’s unclear how much control Buntzen actually had over the BCERC’s operations—all major decisions came from London—but in any event, he was a man unafraid to push the company’s agenda. 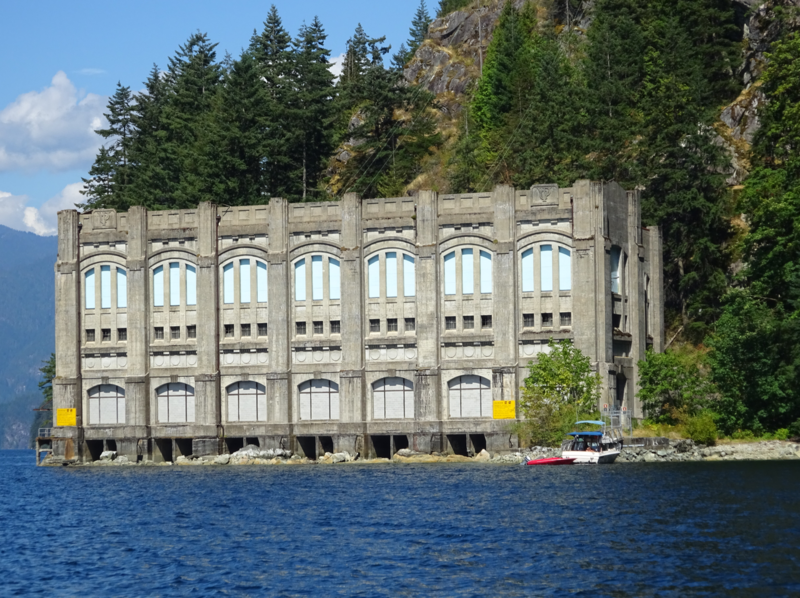 It was under his watch that the site for Powerhouse #1 was selected in the fall of 1901, and an ambitious scheme was hatched to power it: diverting water from Coquitlam Lake into nearby Lake Beautiful via a tunnel drilled through 13,000 feet of solid granite. The tunnel and powerhouse were completed in an astonishingly short period. In June of 1905, at a lavish ceremony attended by more than 200 people, the water was switched on for the first time, and Lake Beautiful was rechristened in Buntzen’s honour. 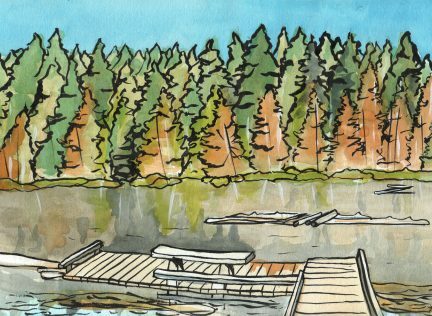 Come December, the city of Vancouver was running on hydro-electric power; but the original dam—and the company’s promise of having a minimal impact on Coquitlam Lake’s water—didn’t last long. By 1908, the dam was leaking so badly that as much water was being lost as was running through the tunnel. By 1909, there were thousands of dead, rotting salmon on its surface—so many that men with pitchforks were regularly sent in to clear them out. On top of that, the entire project was illegal under federal law, which stated that any water diverted from one watershed had to be returned to its original source. But rather than step back from a challenge, the BCERC ratcheted up its plans. Demand for electricity in Metro Vancouver was increasing faster than anyone had expected; two years after construction on Powerhouse #1 was completed, the company was forced to install additional generators—something they continued to do at a rate of almost one per year until 1912. 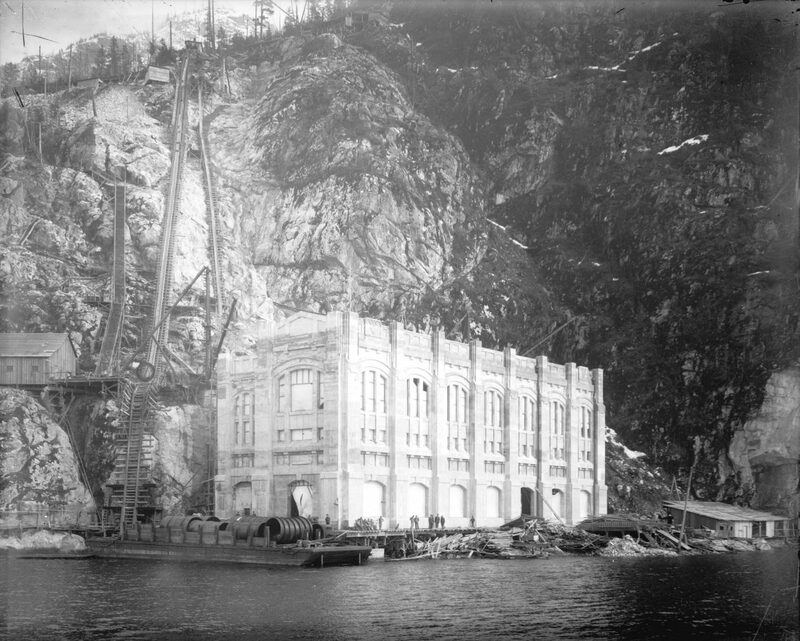 In order to keep up, they argued, they would have to build a second powerhouse, and raise the dam to a whopping 98 feet, thus tripling the water flow from Buntzen Lake. When they caught wind of the proposal, Coquitlam City Council members were horrified. Not only were they worried about what might happen if the dam burst, but they knew that such a move would decimate their water supply. They sent a petition to Victoria protesting the idea, and shortly after, other political entities joined the fray. In 1909, the Justice Department argued that such a move would destroy local fisheries, and New Westminster City Council sent its own engineering consultant to investigate. But the BCERC wasn’t backing down, instead buying off local newspapers to keep dissent out of the press and bribing politicians (Interior Minister Frank Oliver was so completely in the BCERC’s pocket that he provided the company with confidential government documents during a Supreme Court challenge launched by the City of New Westminster); even a former MP named Andrew Thompson was hired to take the company’s interests directly to the federal government. Thompson was startlingly successful. Not only did he get the government to pull the water licenses of both New Westminster and Coquitlam (thus granting the BCERC virtually all of the water in Coquitlam and Buntzen lakes), but he also convinced politicians to change the legislation that required water to be returned to its source, thus fully legalizing the dam project. By the time the new dam was completed in 1914, Johannes Buntzen was out of the picture. 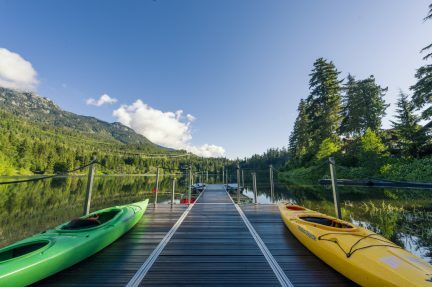 Whether he retired or simply moved on is unclear, but the lake that bore his name continued to serve the Greater Vancouver region, thanks in part to the construction of Powerhouse #2, which was finished that same year. Among historians, there is some disagreement over who actually designed the iconic structure—some attribute it to Francis Rattenbury, the architect behind the B.C. Legislature and Victoria’s Empress Hotel (who, in a sensational twist, was later murdered by his wife’s 18-year-old lover), but a more likely explanation is that it was the work of Robert Lyon, a lesser-known architect in the employ of the BCERC. Originally, the two powerhouses were operated manually by a small community of workers who lived in the hills above Indian Arm. Until 1953, when the facilities were finally automated, families inhabited the remote wilderness, sending their children to school in a building attached to Powerhouse #1 and receiving weekly deliveries of groceries by boat. Today, the operation only supplies around 0.4 per cent of Greater Vancouver’s electricity. 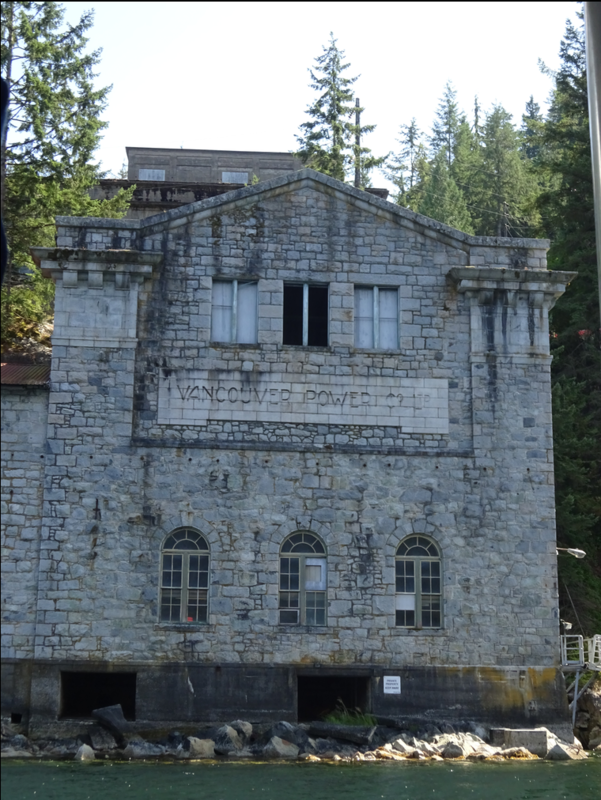 Powerhouse #2 was shut down in the 1950s; Powerhouse #1, which still retains some of its original hardware, remains B.C.’s oldest functioning hydroelectric power plant. 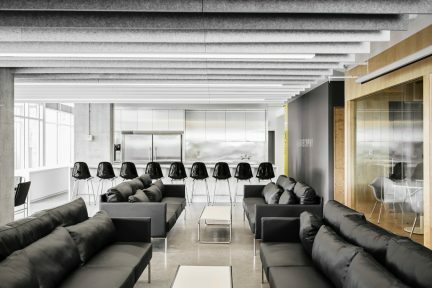 The BCERC and Vancouver Power Company have long since been absorbed by BC Hydro, and their archives (some 200-plus boxes of correspondence) are housed at the University of British Columbia. But for those kayakers and urban explorers who are able to catch a glimpse of the lonely structures, they are a reminder of the white coal that the BCERC so coveted, and the lengths to which it went to get it.